While Formula Feeding remains to be the second choice of health professionals and mothers in terms of the main nourishment of babies, it cannot be denied that it plays a critical role in filling the void left by unsuccessful breastfeeding relationships between a mother and her infant. As it is, even manufacturers admit that formula milk cannot replicate the many benefits of breastmilk. They however are quick to follow up that they are doing all they can to infuse it with the nutrients needed to ensure that the babies who rely on it for their nourishment will get adequate nutrients that their formula can provide. This guide hopes to help families choose the best formula milk for their children. And while the best way to determine which formula to pick largely depends on the baby’s pediatrician, the baby and the family of course plays a role on what formula to purchase given their budget, and their other priorities in choosing one. The pediatrician’s recommendations remain to be the helpful guide in determining which one to choose. This formula milk buying guide aims to provide relevant and comprehensive information in buying formula milk. This guide will discuss the reasons for choosing to feed formula, formula feeding advantages and disadvantages, types, and kinds of formula milk, factors to consider when buying, general tips when purchasing, and our recommended brands of formula according to the child’s needs. There are possibly a host of reasons why mothers give formula milk to their babies. One of the top reasons for this is an unsuccessful breastfeeding relationship. Some mothers really do struggle in nursing their child that formula has become a savior. And while breastfeeding advocates blame this on lacak of information on breastfeeding, most mothers who succumbed to formula says they had no choice but to ensure that their child gets fed. Another reason why an infant would need formula is when the baby cannot directly latch on to the mother, and the mother unfortunately cannot pump enough milk to feed her baby. This is further complicated by not being able to get enough breastmilk donations to continue a breastfed existence for the child. Returning to work, is another major reason for choosing to give formula to the child. The mother may not have been able to express enough milk while away from her child, either because of lack of information, lack of equipment, lack of facility, or issues in the workplace. Of course, a mother with health issues, and cannot breastfeed her own child would also choose to formula feed to ensure the child gets enough nutrition. Whatever the reasons are, the fact remains that there are advantages and disadvantages of Formula Milk feeding. While others choose to mix feed to give the mother a leeway to spend time away from the baby, either for work or rest and leisure, supplementing also has its own risks and benefits. Supplementing is basically breastfeeding and formula feeding together, done to ensure that the baby meets his needs for milk. Supplementing is also called “mix feeding” and it usually occurs within the first year of a baby’s life. It usually happens when breastfeeding issues arise, the mom returns to work, or the mom suddenly gets pregnant and could not tandem feed due to health reasons or pregnancy sensitivities. Formula feeding also takes place when the baby is no longer in the care of his mother, like if something untoward happens to the mother and she can no longer breastfeed, or worse the baby has to be put in another person’s permanent care like in an institution or an adoptive family. Buying expressed milk may be too expensive for this purpose, and so if there is any benefits of formula feeding over breastfeeding, this would be it. Whatever the reasons are, families will always wonder at first which formula to give their child. This guide aims to help families come into an informed decision in purchasing their chosen breastmilk substitute. Formula milk comes in different preparations. Some may need to be reconstituted, some are already fine to be taken right away. Powdered. Powdered formula milk if the most prevalent type of formula milk in the market. It has the longest shelf life, it is easier to store, and it is definitely more affordable compared to the other two kinds. Usually the pediatrician or the manufacturer will recommend the ratio of the powdered milk to water when reconstituting. Concentrated. Concentrated formula milk is like a syrup version where a certain ratio of water shall be added to the concentrate to come up with the formula milk that is ready to be given to an infant. This formulation is easier to mix and reconstitute compared to the powdered version, but it is more expensive. It also has a shorter shelf life compared to the dry powder formula once it is opened from the packaging. Ready-to-Drink. Is the chose formulation of moms-on-the-go, especially when travelling with the baby in tow. While it is the most convenient type of formulation as all the mom needs to do is to warm it up a bit, it can be the most expensive and bulkiest to store in a home. Standard. This is the most common type of formula milk, and is usually recommended for infants who may have no digestive or allergy issues. It is also the most widely available formulation in the market and is relatively the most affordable type. It is usually made of whey protein – a type of protein from cow’s milk that is said to be easier to digest for infants. 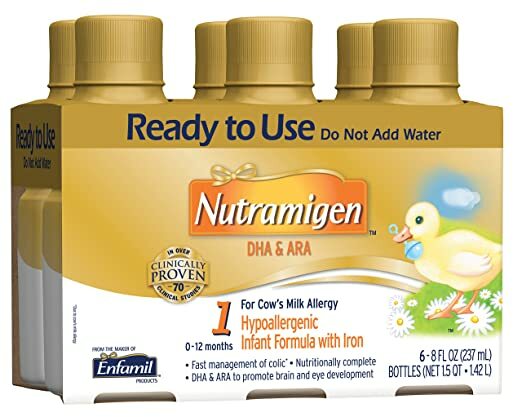 Hypo-allergenic – Hypoallergenic formulas are also called Protein Hydrolysate Formula Milk which is often prescribed to babies with Cow’s Milk Protein Allergy. In a Hypo Allergenic Milk the protein in the cow’s milk has been hydrolyzed or further broken down into manageable levels that can be digested easily by infants. It is one of the most expensive types of formula in the market. This is usually be given alongside a medical prescription. Lactose-Free – Is prescribed by pediatrician to babies that are lactose intolerant or cannot absorb the sugar that is found in the milk. Lactose intolerance is usually signified by diarrhea, wind or bloating. This however should be confirmed by a pediatrician prior to making the switch. Organic – Organic formula is usually given to babies whose parents prefer giving plant-based, non-genetically modified, milk formula for their babies. Most organic formula in the market also contain the nutrients that are added into the cow’s milk based formula. It usually is one of the more expensive milk formulas in the market. Soy Formula – This is the choice formula milk for parents who may not want to give animal protein to their children. At the same time it is also a great option for babies who are lactose intolerant, or allergic to cow’s milk protein. As its name suggests, this milk is sourced from Soy, which may or may not be organic. Manufacturers usually indicate if the soy-based milk is from organic sources or not. Formula Milk for infants. This is the usual first type of formula milk prescribed for children who will be purely formula fed, or mixed fed alongside breastmilk. It can take on the different types mentioned in the list above. It is usually good for babies from newborn stage till one year old. Formula Milk for toddlers. Although babies one year old and up can already be given cow’s milk, some pediatricians and parents still prefer to give their children specialized formula whose nutrients are suited to the needs of their specific age group. Toddler Formula is a formula meant for children one to three years old. Formula Milk for preschool aged children. This is another specialized milk for a specific age group of children. Again for children that lack nourishment, or may have absorption issues, formula milk for pre-school aged children may be prescribed by the family’s health practitioner. Pediatrician’s Advice. It is always wise to seek for the pediatrician’s recommended type of formula for your baby. After all they know your baby’s condition, and if he or she needs a special milk formula should he react negatively to ordinary infant formula initially given to him. Switching to different types of formula milk, or giving one based on own preference should still be cleared with the doctor to prevent allergies, constipation and other gastric discomfort or issues on the infant. Family’s Preference. Some families may be very vigilant in terms of what they feed their child. If the whole family lives on an organic, non-genetically modified diet then most likely they will choose formula milk from organic sources as well for their baby. Family Budget. Finances will also most likely dictate the choice of formula milk for a baby. Expensive formula milk with specialized formulation, or from organic sources may not be the choice of a low-income family who also have to balance their other needs alongside that of their infant. Baby’s Preference or Reaction. The baby’s reaction to the formula milk given to him will strongly influence the choice of formula for the baby. Always take note of the newborn formula feeding chart when starting off giving formula to your newborn infant. Quality of Formula Milk. Most infant formula in the market will say that their milk is boosted with different nutrients that will support the child’s brain and body development. Most of the added nutrients that enhance a child’s formula include AHA, DHA, ARA, Prebiotics, and Probiotics. According to manufacturers, this additives help mimic breastmilk components, helps strengthen formula fed babies immune system and can help them answer positively the question – are formula fed babies healthy? Do not buy in bulk prior to trying. Like any other baby item, formula should never be bought in huge amounts before seeing the baby’s reaction to it. He may be allergic to it, get constipated, or have diarrhea with a certain formulation. It will also be even better if a smaller can or package be bought prior to buying a bigger one so as not to waste on resources. Better yet, take advantage of the physician’s samples to see your baby’s reaction to it. Take advantage of shopping deals. Whether online or in physical stores, parents should watch out for deals on their formula milk of choice, and take advantage of them. Some even have free shipping, adding more shopping convenience for parents. Be vigilant though about the expiration dates of the milk. Use Coupons. Use coupons and formula discounts whether from online or offline sources, to get a price cut on the formula milk you are buying. Stores or manufacturers usually provide these, so a little bit of research and resourcefulness may be needed. Use special formulation or type of formula, only when needed. If the baby is not lactose intolerant, or can do with ordinary formula milk then he may go along fine with taking ordinary formula milk. You may also want to try generic or store brand types, and see if the baby is fine with it. Always follow formula feeding guidelines set forth by health practitioners and the formula manufacturers. Meanwhile here are some safety tips in formula feeding. Be aware of the Expiration Date – Never use outdated or expired formula on your child. The milk may be tainted and can affect the health of your baby adversely. Take caution in switching formula. Always consult your baby’s pediatrician before changing the formula milk you give her. This is because the pediatrician is in the best position to assess the needs of the baby in terms of formula milk. Use distilled water. Always use distilled water when reconstituting powdered formula. If distilled water is unavailable then ask your pediatrician if it is fine to use boiled tap water. Ensure good hygiene practices. Always wash hands prior to preparing formula milk. This is to ensure that the milk will not get contaminated with viruses and bacteria. Sterilize feeding accessories. Always wash and properly sterilize all the feeding bottle and accessories used in formula feeding your baby. This is to ensure that the milk will not be tainted with germs and bacteria that may cause him to fall ill. Premature infants have special milk needs. When it comes to formula, so it is best to consult the pediatrician for their recommended milk formula. Usually concentrated formula is given for preemies, as dry powdered formula is non-sterile. Mix and Measure carefully. Ensure that the proper milk to water ratio is implemented each time a bottle of formula is reconstituted for the child. Too much water in the mix may cause water intoxication. Never warm formula milk in the microwave. Heating in the microwave may cause hot spots within the mixture so never warm a bottle in the microwave. It is still best to just warm a bottle in a bowl of hot water, or use a standard bottle warmer instead. Never freeze reconstituted formula. If it is needed to be stored, store it in the coldest area of your refrigerator and discard it if it has not been used within the next 24 hours. Use a cooler with gel iced packs when you have to transport pre-mixed or reconstituted formula bottles. Hold the baby during bottle-feeding. You must be able to check his reaction during the feed – say if the flow is too strong for him and he cannot keep up, or if he does not want to drink milk already. Never force the baby to finish the whole bottle when she clearly no longer likes to because it will only cause unnecessary weight gain. Formula-Feeding moms swear by Enfamil Infant Baby Formula that has been known to completely meet the nutritional requirements of infants from birth up to 12 months of age. It is said to be nutritionally complete as it can address the needs of a newborn infant, up until he rolls over to the toddler stage or 12 months. The nutrients that are used to enhance this breastmilk substitute helps the infant achieve his physical and mental milestones, even until he becomes an older baby. This formula also takes pride in being enhanced with what it calls “NeuroComplete” formulation that is composed of brain-building nutrients like DHA, Choline, and Iron. These set of nutrients and additives also help develop the optical senses of the baby. 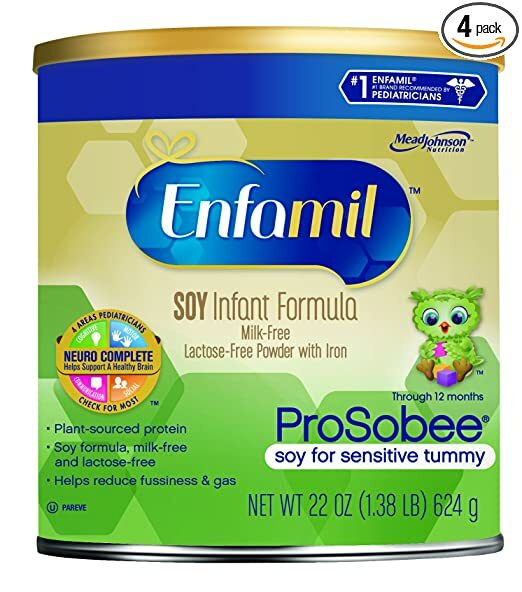 Moreover Enfamil Infant Baby Formula is designed as well to help boost the baby’s immune system through the prebiotics that has been included in the formula. The prebiotics in this formula feeds the good bacteria in the baby’s gut, which in turn helps strengthen his immunity. 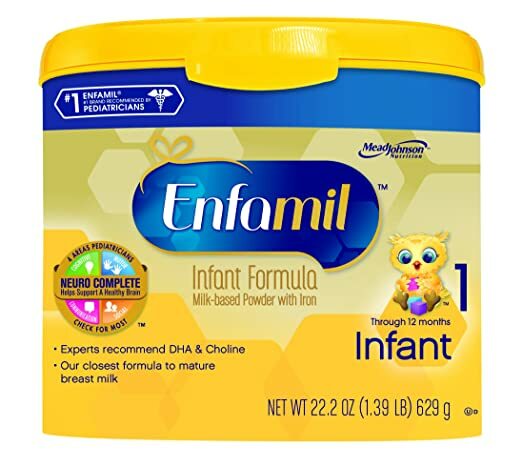 For mix-feeding moms, you may be glad to know that the nutrients and formulation of Enfamil is closest to mature breast milk as it is patterned after breastmilk’s gold standard of nutrition. This is the reason why this formula is recommended by most pediatricians. As much as most parents want to provide the best formula milk for their infants, such formula may come at a price. A price that could be beyond what the family can regularly afford. 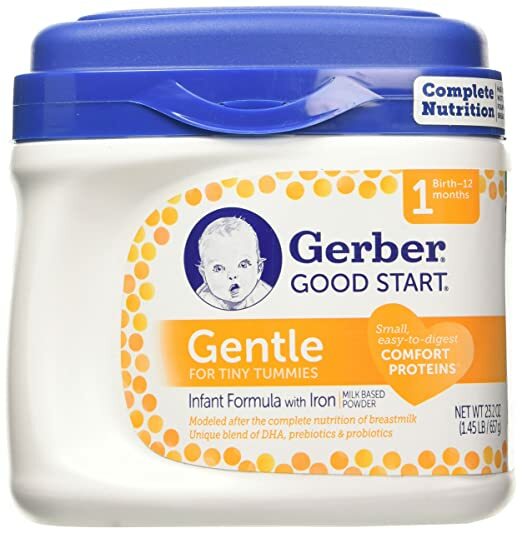 The good news for parents is that Gerber Good Start Gentle Powder Infant Formula is available in the market, and is as great to little tummies in terms of sensitivity and provisioning of nutritional needs. In developing this formula, Gerber aimed to mimic breastmilk in terms of gentleness to the stomach and the benefits that it provides. In short, it is easy and quick to digest and does not cause constipation among little tots. It also contains DHA that promotes brain and eye development, anti-oxidants, and prebiotics, plus the iron and other needed nutrients for baby’s development. All these benefits and nutrients at a price point that parents can definitely afford. It is no wonder why this formula remains on top of bestseller lists. Nutramigen Ready-to-Use infant formula is hands-down the best-rated ready-to-drink infant formula in the market today. This formula is nutritionally complete enough to support the baby’s mental and physical development, and aids in achieving the baby’s milestones. It is patterned after the nutrients in breastmilk such as DHA and ARA that enhances eye and brain development. Moreover, it helps sensitive tummies quickly, because within two days of using this formula colic can be managed right away. And once the parent has already resolved this tummy trouble, the baby can sleep better, and play better. Its Probiotic LGG does not only help manage colic, it also helps the baby build tolerance to cow’s milk protein so that he will not be as sensitive to it. Having said that, this formulation is also lactose-free and hypo allergenic. Truly, it is the best ready to drink formula in the market, providing convenience and better digestion and development for babies 0 to 12 months. 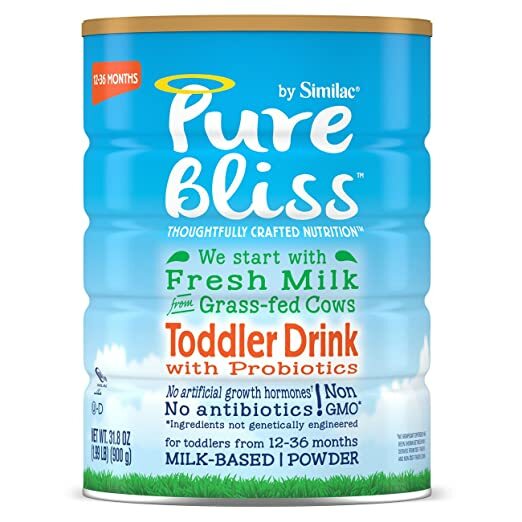 If you are looking for the best formula milk for your toddler (aged 12 to 36 months), then Pure Bliss by Similac Toddler Drink with Probiotics is the best choice there is. It is sourced from fresh grass-fed cow’s milk and ingredients that are not genetically-modified. This means that this specific formula does not come with artificial growth hormones as well as antibiotics. Apart from being non-GMO it is also complete with 18 key nutrients essential for your child’s mental and physical development. Brain and eye development will also get a boost from this formula as it contains DHA and ARA that it contains. It is also gluten-free, and has no artificial growth hormones. Truly it is our choice for the best toddler milk in the market today. This formula claims to be the closets-ever formulation to breastmilk as it comes with the Human Milk Oligosaccharide (HMO) that helps support the baby’s immunity. 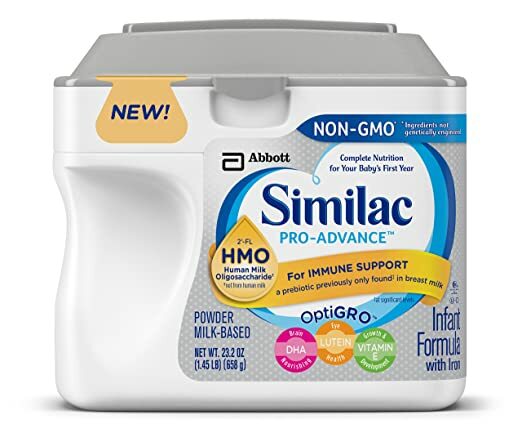 The manufacturer explains that HMO is only previously found in breastmilk, but this prebiotic can now actually be used to enhance the baby’s milk formula. It also makes use of non-genetically modified ingredients to ensure that everything that enters the baby’s body are of highest standards and will not cause harm to it in the future. The complete nutritional content of this formula milk supports the baby’s growth from newborn stage and throughout his first year of life. It also has DHA, Lutein, and Vitamin E or OptiGro as the manufacturer call it that helps further cell development in the brain, and the eyes. It also has prebiotics for immune support. 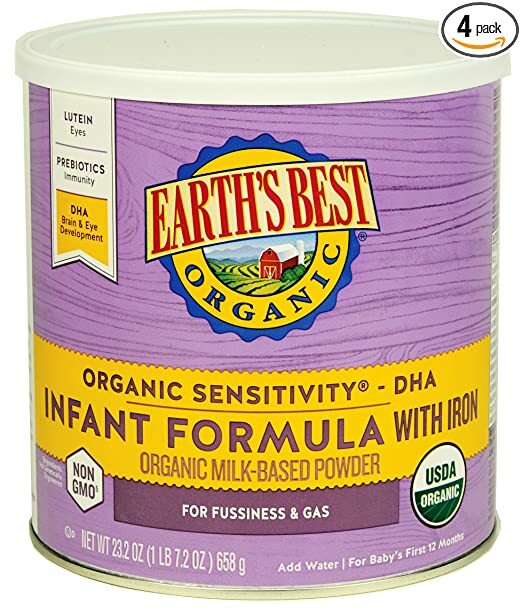 Earth’s Best Organic Sensitivity Infant Formula is not just only a best-seller, it is a widely recommended organic infant formula for babies aged zero to 12 months. It is USDA Certified Organic with no colors, artificial flavors, preservatives, growth hormones, steroids, and potentially harmful herbicides and pesticides. It is also kosher. It is also nutritionally complete while being low in lactose and easier to digest. This special formulation was achieved by making whey dominant in the mix plus carefully picked carbohydrate blend that is gentle to the baby’s stomach. Developmental-wise it comes with DHA, ARA, Lutein and Prebiotics that boost brain development, immunity, and eye development. Truly, Earth’s Best is the top pick when it comes to organic infant formula. 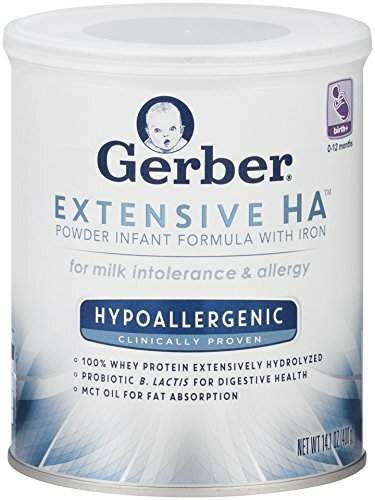 If you have been searching for the best hypoallergenic formula for your baby then the Gerber Extensive HA Hypoallergenic Powder Infant Formula with Iron is so far the best in terms of hypoallergenic milk offerings in the market. It is composed of 100% whey protein that is broken down extensively to levels that can be easily managed by a baby’s digestion. This means less fussiness, colic episodes, indigestion and constipation. Apart from Iron, essential nutrients, and calcium, this hypoallergenic formula is also enhanced with fatty acids, specifically DHA which helps boost brain and eye development. It also has a healthy balance of probiotics specifically the B. Lactis good bacteria to ensure a better digestive health for the infant. It also has a special oil blend that helps facilitate absorption. Specific components of this oil blend include DHA and MCT or Medium Chain Triglycerides that helps the nutrients in the milk get fully and quickly absorbed. The Enfamil ProSobee Baby Formula is number one in the market for many reasons. It has caught the attention of parents because it is gentlest to the baby’s stomach. Unlike cow’s milk based formula, it reduces gas and fussiness on the baby. And since it is plant-based, it is virtually dairy-free, lactose-free, and milk-free making it perfect for babies who are having a hard time digesting formula. It also has all the nutrients and components that make it a perfect, complete food for infants zero to 12 months. Moreover it enhances the baby’s brain power and development given the levels of DHA and fatty acids in it. It is also the perfect choice for families who have vegetarian or kosher diets.